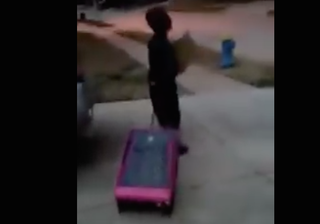 A young boy is seen in video walking down the sidewalk pulling his suitcase after his mother reportedly kicked him out for voting for Donald Trump in a mock school election. A Houston mother is under investigation after posting a video showing her kicking out her young son because he voted for Donald Trump during a mock election at his elementary school, KHOU reports. The video went viral, with commenters criticizing the mother for her actions and saying she should be in jail. "I can't believe a mother would go against her son like that and put her kid through that much trauma. That's awful," a neighbor, Mike Terry, told the news station. At the beginning of the video, the mom can be heard telling the boy, "Since you voted for Trump, you can get your [s—t] and get out. "Uh-uh, the suitcase is packed by the door," she adds as the boy begins to cry. "We don't do Donald Trump here." The mother repeatedly tells the boy to get his suitcase and get out as he wails and begs his mother to stay. Once outside, the woman makes the boy hold a sign saying, "My mom kicked me out because I voted for Donald Trump." As the child walks down the sidewalk, the woman can be heard saying, "Bye, Donald Trump lover." Later on in the video, the woman asks the child why he voted for Trump. "Because I see him on TV a lot," the child responds. "Boy, bye," his mother scoffs at him. "Well, I hope you find another TV to see him on 'cause this is gonna be your new home." Detectives said the mother told them she was just trying to make a joke. And while investigators acknowledge that the video is disturbing, there is no evidence of criminal wrongdoing. According to KHOU, a detective met with the family and said that the boy appears to be OK. The mother, the detective added, also apologized for the video.